This order was founded by Don Pedro on the 17th October, 1829, the day of his second marriage with the Princess Amalie Eugenie Napoleone of Leuchtenberg and Eichstadt, daughter of the celebrated Prince Eugene, Due de Leuchtenberg. It was destined as a reward for both civil and military merit. The Order, of which the Emperor is Grand Master, has eight real, and eight honorary Knights of the Grand Cross, sixteen Grand Dignitaries, thirty Dignitaries, and an unlimited number of Commanders, Officers and Knights. The heir presumptive to the throne, or Crown Prince, is at once Knight of the Grand Cross and Dignitary, while the other Princes of blood are only the former. Only those with the title Excellency, are admissible to the Grand Cross, while the Grand Dignitaries receive the title (Excellency) with their nomination. The Dignitaries are chosen from those who are already styled, Senhor, while with the nomination of Commander, the candidate receives the title (Senhor). The Officers receive, with the Order, the rank of Colonel, and the Knights that of Captain. The insignia (No. 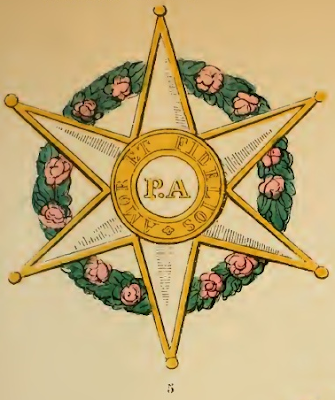 6) consist of a white enamelled hexagonal star with gold edges, the six points of which bear small balls ; the star is fastened by the upper point to a gold imperial crown, surrounded by a wreath of full blown roses. Upon the white ground of the front are seen the letters, P. A. (Pedro and Amalie), encompassed by a broad golden ring or circle, with the legend, "Amore Fidelios" (Love and fidehty). The gold centre of the reverse shows the date of the foundation, while the blue ring round it has the words, "Pedro e Amalia". The Order is worn by a rose coloured or pink ribbon, with white borders, the width of which varies with the various degrees of the wearers. 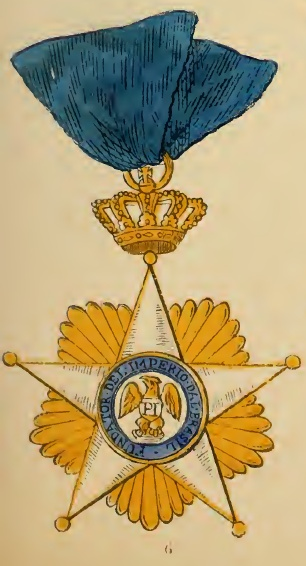 The Knights of the Grand Cross wear it across the right shoulder, the Dignitaries round the neck, and the three other classes upon the left breast. The five superior classes wear, besides, upon the left breast, a star (No. 5) exactly resembling the obverse of the Order, except that it is nmuch larger, and is in addition surmounted by a gold crown, for the Knights of the Grand Cross and Dignitaries. The eight real Knights of the Grand Cross wear, besides, on solemn occasions, a gold chain of roses worked in enamel.